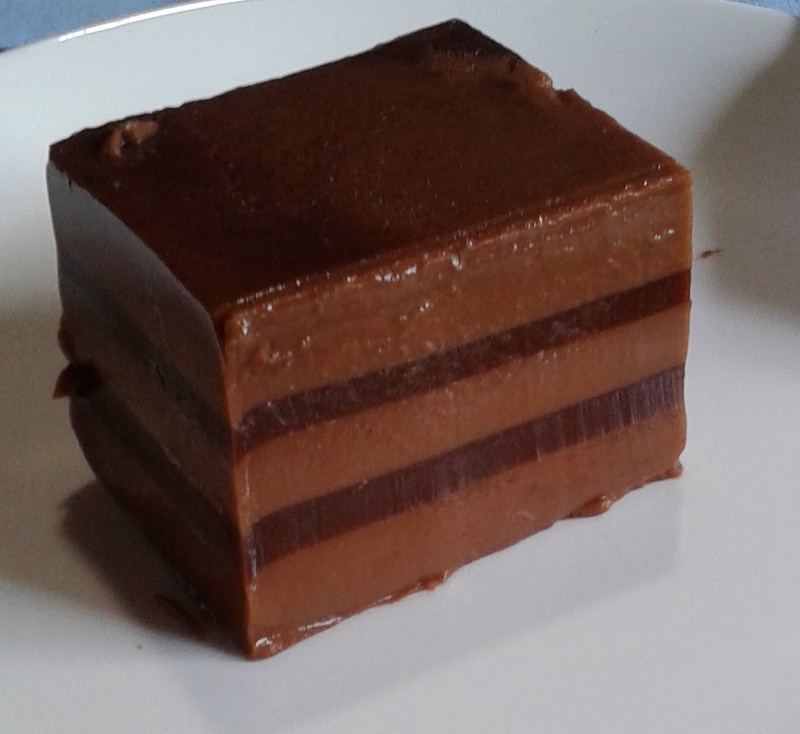 I was inspired to make this from a striped coffee jelly dessert recipe I saw on the Net but I didn't quite like the idea of using all coffee in the dessert so I made my own changes substituting some of the coffee powder with cocoa powder and so I am presenting to you this striped chocolate jelly. This is my first time working with gelatin and I was a bit apprehensive about how this would turn out. 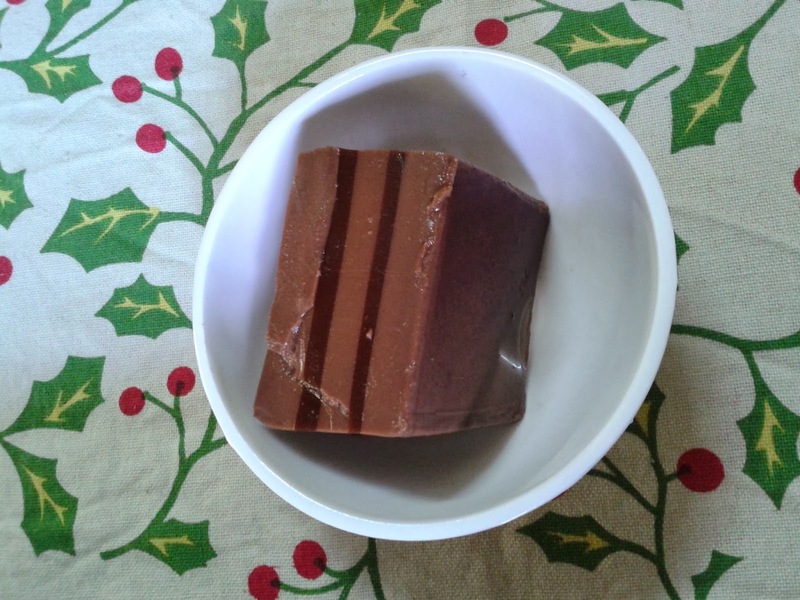 I made this dessert for Christmas and it turned out to be quite a hit. Do try it out and let me know what you think. Soak the gelatin in one cup of water in a vessel. Dissolve the gelatin by heating the vessel in a double boiler or over a pan of hot water. Heatthe remaining water and dissolve the coffee powder and the cocoa powder in it. Divide the cocoa and coffee mixture into one part and two parts. Add one third of the dissolved gelatin and half the sugar to one portion. Keep aside this black jelly. Add the sweetened condensed milk to the other two parts of the cocos and coffee mixture along with the rest of the gelatin. You can also adjust the sweetness of the two mixtures by tasting them and adding more sugar if desired. Take a cake tin or any suitable bowl which can resist heat if you want to turn out the jeely pudding on to a plate. Pour one third of the milk mixture and chill in refrigerator till set. Then stir the cocoa coffee mix and pour half over the set jelly. Chill in the fridge again. Stir each mixture well before layering and continue like this so that you have 3 milky layers (1/3 qty used each time) and 2 dark layers (1/2 qty used each time) in between as shown in the picture. Chill after each layer has been poured in and when it sets, pour in the next layer. Just before serving, keep the jelly out for a few minutes and then invert onto a platter. Alternatively, you could dip the cake tin in hot water for a few seconds to loosen the dessert. Cut into squares or into whatever shapes you see fit. Soak gelatin in one cup water. Dissolve by heating over a pan of hot water or in a double boiler. Dissolve coffee powder in the remaining three cups of hot water. Divide the coffee liquor into two equal portions. Add half of the dissolved gelatin and sugar to one portion. Keep aside this black coffee jelly. Add sweetened condensed milk to the other portion of coffee along with the remaining gelatin. Mix well to get milk coffee jelly mixture. In a small loaf tin pour 1/2 inch layer of black coffee jelly & chill until set. Then pour a ½ inch layer of milk coffee jelly over the set black coffee jelly. Chill in the fridge again. Stir each of the jelly well before layering. Similarly, alternate layers until both the jelly is used up. Chill until set. Dip loaf tin in hot water to loosen the coffee pudding. Invert & unmould gently onto a plate. Cut into sufficiently thick slices. Serve chilled with whipped cream & decorate with cherries if desired.